Although the general layout of the content is not restricted, particular information is mandatory and must be present on the Mandate. 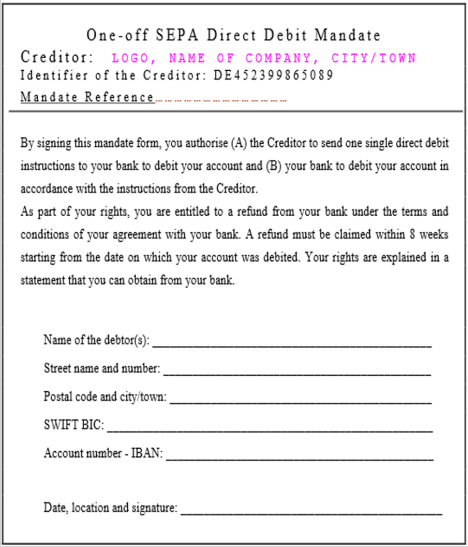 This includes information for the Debtor to indentify the collection on their bank account, such as a Unique Mandate Reference (UMR). The UMR is supplied by the Creditor. This Debtor must be aware of the reference before a collection is made. It also appears against the SDD transaction on the Debtor’s bank statement. The UMR must be unique as the name suggests e.g. could be per service provided to the debtor. The Mandate must also include the ‘legal text’ regarding the instruction and SEPA Direct Debit Refund. Other rules exist around the Mandates’s design and layout, all of which aid with successful collections and protect the integrity of the scheme. SEPA Mandates vary in layout & content, depending on the type of SDD collection you wish to make. There are different rules for wording depending on the frequency of collection or for 3rd party payments. With 3rd party payments additional collection details are required Including the details of the service/ product being paid for and/ or details of the collection/s. Both the required debtor and frequency details must be present on the Mandate, but varying combinations of the two are permitted. 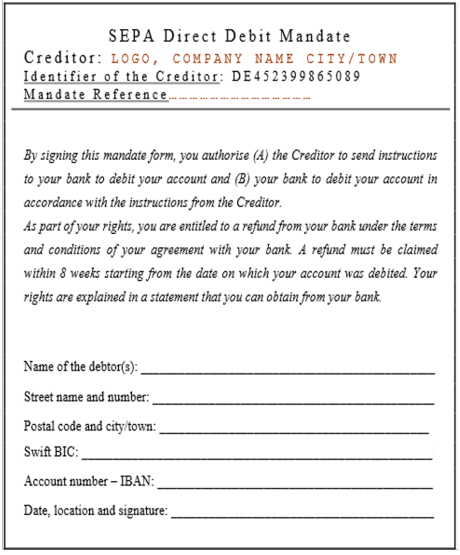 As this is a recurring or ongoing collection, the mandate is maintained at the Debtor bank for repeat use. This will go dormant after 36 months of no collection. The mandate is then to be destroyed after its one and only use. An E-Mandate would be completed by your customer through an electronic channel within their own internet banking. The use of E-Mandates is covered by the SEPA Direct Debit rulebooks however it remains an optional service for the Bank. It is yet to be offered by many banks thus deeming the use of E-Mandates unrealistic in the current environment. This may well change as PSD2 comes into force across Europe alongside open banking. This should be used where a different party is paying on behalf of the customer. It includes a section to capture 3rd Party details so that notifications can be sent to the correct person.